Protein complex offers explanation for how animals sense Earth's magnetic pull. 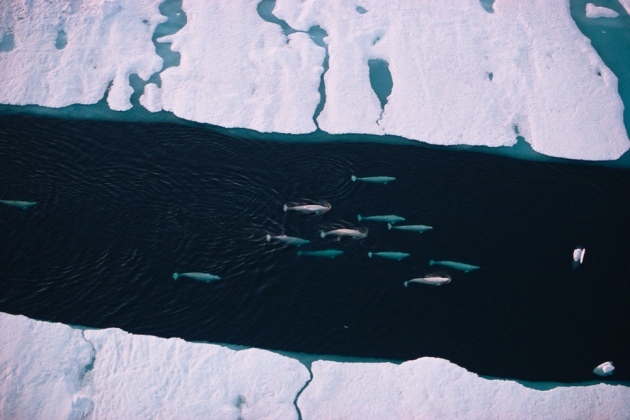 Beluga whales are among the species that are thought to use Earth’s weak magnetic field for navigation. In the cells of fruit flies, Chinese scientists say that they have found a biological compass needle: a rod-shaped complex of proteins that can align with Earth’s weak magnetic field. 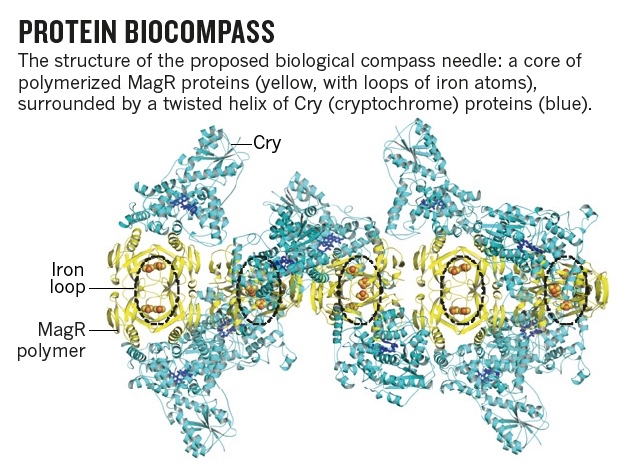 The biocompass — whose constituent proteins exist in related forms in other species, including humans — could explain a long-standing puzzle: how animals such as birds and insects sense magnetism. It might also become an invaluable tool for using magnetic fields to control cells, report researchers led by biophysicist Xie Can at Peking University in Beijing, in a paper published on 16 November in Nature Materials (S. Qin et al. Nature Mater., 2015). “It’s an extraordinary paper,” says Peter Hore, a biochemist at the University of Oxford, UK. But Xie’s team has not shown that the complex actually behaves as a biocompass inside living cells, nor explained exactly how it senses magnetism. “It’s either a very important paper or totally wrong. I strongly suspect the latter,” says David Keays, a neuroscientist who studies magnetoreception at the Institute of Molecular Pathology in Vienna. Many organisms — ranging from whales to butterflies, and termites to pigeons — use Earth’s magnetic field to navigate or orient themselves in space. But the molecular mechanism behind this ability, termed magneto-reception, is unclear. Some researchers have pointed to magnetically sensitive proteins called ‘cryptochromes’, or ‘Cry’. Fruit flies lacking the proteins lose their sensitivity to magnetic fields, for example. But the Cry proteins alone cannot act as a compass, says Xie, because they cannot sense the polarity (north–south orientation) of magnetic fields. Others have suggested that iron-based minerals might be responsible. Magnetite, a form of iron oxide, has been found in the beak cells of homing pigeons. Yet studies suggest that magnetite plays no part in pigeon magnetoreception. Xie says that he has found a protein in fruit flies that both binds to iron and interacts with Cry. Known as CG8198, it binds iron and sulfur atoms and is involved in fruit-fly circadian rhythms. Together with Cry, it forms a nanoscale ‘needle’: a rod-like core of CG8198 polymers with an outer layer of Cry proteins that twists around the core (see 'Protein biocompass'). Credit: S. Qin et al. Nature Mater. http://dx.doi.org/10.1038/nmat4484 (2015). Using an electron microscope, Xie’s team saw assemblies of these rods orienting themselves in a weak magnetic field in the same way as compass needles. Xie gave CG8198 the new name of MagR, for magnetic receptor. The discovery offers scientists the prospect of using magnetic fields to control cells. Over the past decade, scientists have commandeered the light-sensing capacity of some proteins to manipulate neurons, usually by inserting a fibre-optic cable directly into the brain — a tool called optogenetics. But magnetosensing proteins have the advantage that they could be manipulated by magnetic fields outside the brain. Zhang Sheng-jia, a neuroscientist at Tsinghua University in Beijing, claims to have already demonstrated this ‘magnetogenetic’ capability. In September, he provided a surprise preview of Xie’s work when he published a paper reporting use of the biocompass to manipulate neurons in worms (X. Long et al. Sci. Bull. http://doi.org/883; 2015). Xie and others complained that Zhang’s early publication violated a collaboration agreement between the two researchers — the details of which are disputed — and asked for it to be retracted. In October, Zhang was fired from his university, a decision that he is contesting. Xie says that in April, he submitted a Chinese patent application that includes the use of magnetogenetics and the protein’s magnetic capacity to manipulate large molecules. He is also starting to look at the structure of MagR proteins in other animals, including humans. Variants in the human version of MagR might even relate to differences in people’s sense of direction, he suggests. Xie hopes that others will strengthen his case with further experiments, such as inactivating the gene for MagR in certain fruit-fly tissues to see whether it affects the animals’ sense of direction. He published without doing this work, he says, because he just wanted to report the findings, which he has been working on for six years. The lack of an exact mechanism for how the protein complex senses magnetism, or how any signal it sends might be processed by the brain, gives some researchers pause. MagR’s biocompass activity might simply be the result of experimental contamination, says Michael Winklhofer, a magnetism specialist and Earth scientist at Ludwig Maximilian University of Munich in Germany. He is planning experiments to follow up on Xie’s team’s findings. If it holds up, says Winklhofer, then the discovery of MagR “appears to be a major step forward towards unravelling the molecular basis of magnetoreception”.